In this week’s Torah portion, Jacob gets to know his mother’s side of the family. Far from having to stay with Uncle Laban for “a few days,” as hoped by Rebecca, Jacob stays a total of 20 years, and mother and son never re-unite. During those years, Jacob acquires two wives, two concubines, 11 sons (Benjamin is born in next week’s portion), a daughter, and a whole lot of livestock. Trickery, or at least manipulation, occurs throughout. Laban conspires that Jacob will marry Leah in place of Rachel, obtaining his labor for another 7 years so he can marry his beloved. Leah “rents” Jacob from Rachel for a night in exchange for some mandrakes (potential cure for Rachel’s infertility). Laban keeps changing Jacob’s wages and tries to ensure that Jacob will end up with the least desirable livestock, but Jacob outwits him by selective breeding. When they finally leave Haran, Rachel steals Laban’s household idols and conceals having done so. What a family. There are a couple of bright spots in the portion, Jacob’s dream (28:10-22) and the love story of Jacob and Rachel. In the dream, a fleeing, penniless Jacob sees angels going up and down a ladder (more likely a ziggurat) that reaches to heaven. He hears a reassuring message from the Lord, like the one given to Abraham, and to Isaac, concerning their descendants and the land they will inhabit. When he awakes, awed, he says, “Surely the Lord is in this place, and I didn’t know,” and renames the place “Beth El” (house of God). He continues his journey until he sees his lovely cousin Rachel come to water her flock. He rolls a large stone off the well (there’s always a well), waters the sheep, kisses her, weeps, and then introduces himself. He works 7 years for her hand, “and they seemed to him a few days because of his love for her.” I’ve always liked that verse, in spite of knowing what follows. It is most appropriate that I am writing this on Thanksgiving, a family holiday (that so far has resisted being totally overshadowed by holiday shopping). Usually my strongest memories of holidays are of food, but not this time, except for some pumpkin pie at Horn and Hardart’s downtown after Miss Wolf took us to see the Thanksgiving Day parade. I remember things like, my uncles Charles and Syd watching football (nobody in my family watched football); having to stand from Boston to New York when I took the train home during my miserable first year of grad school; and my teenage son’s sudden, emotional realization of how old his grandmother was. We’ve generally avoided exhibiting familial dysfunction at Thanksgiving, for which I am grateful. Many weeks go by before Benny finds someone just like his mother. And not only that, but the girl very quickly falls madly in love with him. So Benny invites her to meet his parents and this time is feeling very optimistic that all will go well. “So everything should have worked out okay for you,” says Rabbi Levy. Steve Conlin knows this: A vodka by any other name would not sell as sweetly. 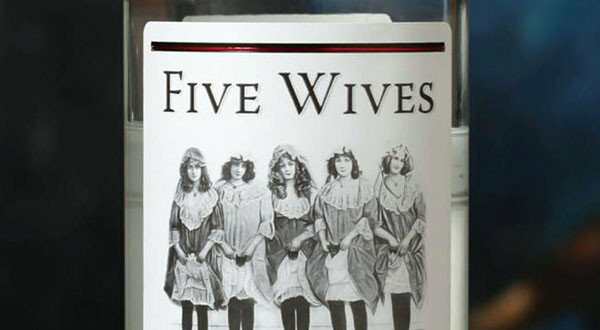 Conlin’s Ogden, Utah, distillery sells Five Wives Vodka, a product using a coy play on the state’s history with polygamy. But not everyone is laughing and, in fact, the neighboring state of Idaho refused to allow the liquor to be sold in the state, citing objections over the vodka’s name. 6. Thanksgiving dinner was supposed to be veal, but there were turkey shabbos leftovers.